Crockett Johnson Homepage: Unpublished Drawing: "Man of the Hour"
Crockett Johnson Homepage > Miscellaneous > Unpublished Drawing: "Man of the Hour"
Unpublished Drawing: "Man of the Hour"
Crockett Johnson probably made this drawing of Barnaby and Mr. O'Malley in 1944. A visitor to the Crockett Johnson Homepage emailed (a jpeg file of) it in late October of 1998. Under the heading "Episode Five: Man of the Hour," a version of this illustration appears on page 179 of Barnaby and Mr. O'Malley (Henry Holt and Company, 1944). 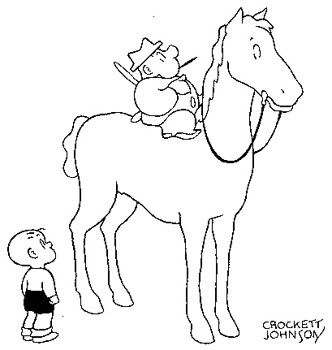 There's one difference between this sketch and the published version: in the book, Barnaby and Johnson's signature have been cropped from the picture, and so we only see Mr. O'Malley atop the horse.